I think it must be about 5 years ago now that I was sitting in my friend's kitchen and saw a colourful and interesting chart on her wall. I hopped down from her breakfast stool and went to take a closer look. I was looking at a detailed Nutrition Chart which brightened up her kitchen. I asked her about it. She had discovered the Nutrition Chart in a similar way to me and pointed out the name "Liz Cook Charts" at the bottom. I made a note, went home, found them online and promptly bought one for myself and my best friend. My Nutrition Wall Chart, which has moved countries with us. My favourite one! My Nutrition Chart is displayed in pride of place in my kitchen and it has moved country with us to France too. I look at it every day (it's on the wall near the kettle!). It features: essential fatty acids, protein, vitamin A, B, B12, C, D, E, K, iron, calcium, zinc, iodine, magnesium, selenium, phosphorous, potassium, fluorine, cobalt, molybdenum, copper, manganese, chromium, fibre and carbohydrates. I have been so surprised at the foods that can provide me with these different nutrients, and it really makes me think about keeping our family meals balanced and inventive ways of doing so. This chart keeps on giving to my household too because my son (now 3) has started to ask about it and show an interest. It has got us talking about foods and goodness and is nurturing an enthusiasm in him which is a joy to experience. My chart still looks as fresh as the day I bought it, due to the quality of the laminated paper. You can even buy it in French, Dutch, German, Swedish, and Japanese (for the links, see the "Useful Info" page on the Liz Cook website). I approached Liz Cook to tell her how much I love her Nutrition Chart, and in the process saw that she does many other equally vibrant and interesting charts too. Liz kindly let us choose some more of her charts that we were most drawn to, so we could review them here for you. So, now Alison too has her own Nutrition Chart for her kitchen. We really love them all. Cleaning our Natural Cleaning Solutions Chart. 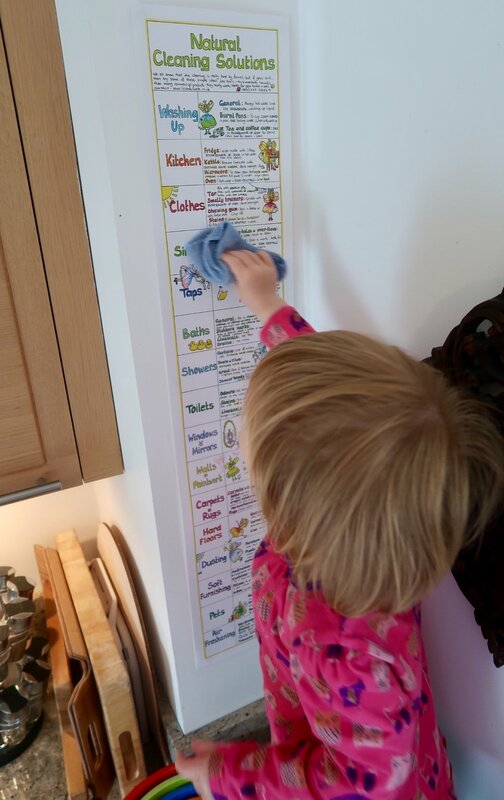 I have put the Natural Cleaning Solutions Chart up in my kitchen, and my nearly 2 year old daughter (who is currently obsessed with cleaning) used a "cheeky wipe" (we love these) to make sure it was all spick and span. Bless her. And when she noticed the fairies all over it, well she squealed with delight. ...because "we all know that the cleaning is really done by fairies"! And then my daughter spotted my new Yoga Charts (Yoga Practice, which is based on the principles of Hatha yoga, and Your Yoga, which builds upon the first chart or can be used as a stand alone one). I had blue tacked them both up onto the wall and set up my exercise mat below. She got very excited, pointed out the sun and went straight into having a try at "downward dog". At bedtime, my 3 year old son opted to do the Sun Salute routine rather than have a bedtime story. No photos of this as he was in his birthday suit, but he was very conscientious about following the pictures and my instructions. I was glad to get them both in bed though so I could have a chance to try the exercises myself. My husband also commented on my new Yoga Charts when he returned from work, I think he will give it a go too. I have placed these in a really prominent position, and as they look so lovely I think they will inspire me to work through the exercises whenever I get a chance. Indeed, should the enthusiasm of my family continue, we will all be at it. Thanks Liz! Yoga Charts: "downward dog" in action, never too young to start! We also received the Seasonal UK Fruits and Vegetables Chart. This is so great to help you select seasonal and local produce. It shows which fruit and vegetables are available for some months only and which are all year round. This is another chart that looks stylish and fun in your kitchen, and will spark up conversation points with children and your friends. With fruit and vegetables being packaged and imported from very far away (such as Kenya and South America), this chart is fabulous for learning and spotting which produce is actually in season in the UK and which isn't. Fresh tastes nicer and lasts longer! Now I must be honest and confess that essential oils aren't something I am particularly into. I have some particularly swish bath oils that my mother in law gave me for Christmas, and I enjoyed some lavender oil during pregnancy to help relax me, but that's about it. The reason being, my sense of smell is unusually appalling (save for in pregnancy - when its appearance was one of my favourite "symptoms"). However, despite this, as with all Liz Cook Charts, I found her beautifully presented Essential Oils Chart compelling to look at and a real feast of information. 16 Essential Oils for Home Use Chart. I really love the Natural First Aid Remedies Chart. I had a sneeky feeling I would before I studied it, and on closer inspection it is really very interesting. Coming from a medical family, and my legal career having a heavy medical component, I am not one to shun conventional medicine, but (and particularly as a reference guide with children in the house) it is nice to know of some gentle first aid options. For example, bugs just love to eat me, I must have tasty blood, so I studied with interest some ways to help with bites. And with my young children I fear that the unavoidable reality of lice will rear its ugly head in our home all too soon. In fact I am probably lucky to have escaped it thus far... I feel itchy just at the thought! 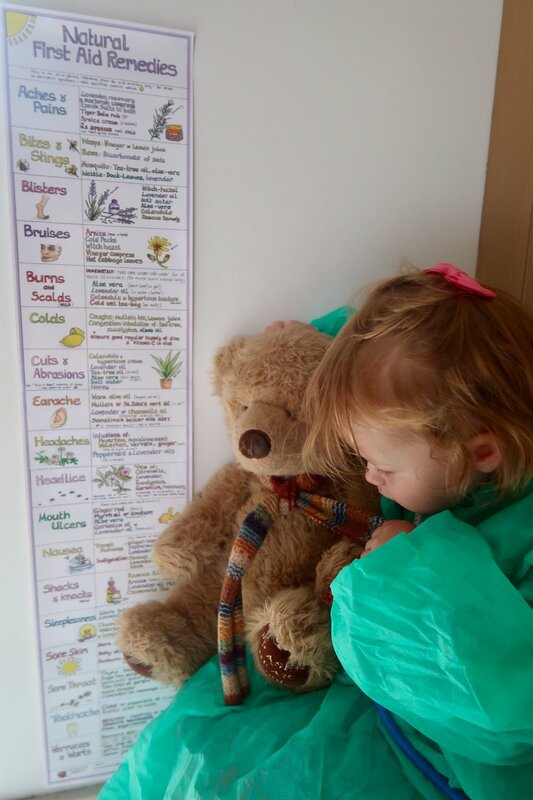 Scrubs and stethoscope ready to administer teddy bear first aid as per our Natural First Aid Remedies chart...! You can buy Liz Cook's Charts (and you should!) from her website www.lizcookcharts.com. Liz Cook's Charts are 88cm wide and 18cm high, so they make really lovely and impactful pieces of artwork to adorn your walls. Whilst you are perusing the Liz Cook website (and looking at the other charts she offers), why don't you get one or two for a friend? These make lovely and unusual gifts, and there really is something for everyone, even dogs!! All of the charts cost £7.95 each. If you buy 2 or more at the same time the price of each is discounted at the checkout to £4.95. UK postage is free, and these charts are also posted internationally (the cost is calculated at checkout), and I would love to help see them in homes all around the world. ...And head over to the Five Little Stars Facebook page to enter a competition to win some of your own. You have until midnight (BST) on 25.6.17 to enter. Good luck! p.s. We were sent the Charts featured above for the purposes of an honest review. As always the opinions are my own. This review also contains an Amazon Affiliate link.